Hydraulic cylinders form the backbone of an astonishing array of commercial, and industrial machines and devices that transport, lift, adjust, and support an equally astonishing array of products, items, and even people. While there are any number of standard and off-the-shelf hydraulic cylinders that can perform a large percentage of the tasks required, custom hydraulic cylinders are often a better choice for specific and mission-critical jobs. Many hydraulic cylinder manufacturers will often modify an existing design to create a custom version designed to better address a specific or unique need. But beyond the simple modification of existing hydraulic cylinder designs lies another, more specialized version of customization that can deliver greater efficiency and return-on-investment. We’re talking about quality engineering – closely analyzing a particular application using statistical, mathematical, and operational management methods and then engineering a specific hydraulic cylinder solution that can actually improve the application – providing greater speed, efficiency, flexibility, safety or some other improved or additional functionality. For example, we recently quality engineered a single-acting spring return cylinder solution for Magliner®, a leading manufacturer of product distribution equipment used by stores, distributors, and warehouses. Their Magliner CooLift Delivery system needed a reliable hydraulic cylinder to help their route drivers be more productive, make fewer trips with bigger product loads, and stay safer moving their deliveries. By carefully analyzing every aspect of a distribution route driver’s delivery-related activities — including pick-up, delivery, and stocking — we were able to quality-engineer a single-acting spring return cylinder solution for the CooLift that enabled Magliner to provide a product delivery system that is safer, more consistent, and more stable. 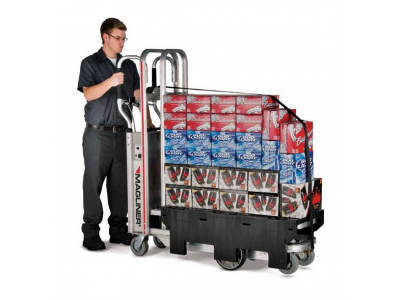 Drivers using the CooLift system are able to easily raise and lower products without manual work using a high capacity lift system that results in bigger loads, fewer trips, and lower fuel costs. For Magliner and many other companies, a quality engineered hydraulic cylinder can make all the difference in the world, helping reduce overhead while increasing customer satisfaction and profitability. Best Metal Products is a manufacturer of standard and custom hydraulic cylinders located in Grand Rapids, MI.